You must use Internet Explorer to access the SureDesk™ Remote Desktop Application. If you are using Internet Explorer 10 or later you will need to add both http://www.suretech.com and https://rdp.suretech.com to your trusted sites. Select the This is a private computer radio button. 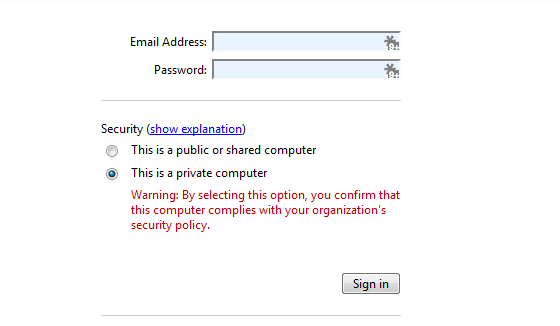 Put in your Email address and Password and then select Sign In. Next select the SureDesk™ group you are assigned to. The groups use an icon like this, . 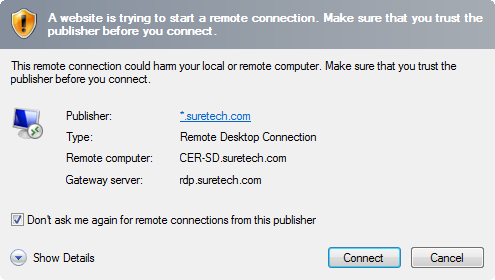 Click the checkbox for Don't ask me again for remote connections from this publisher and the click Connect.